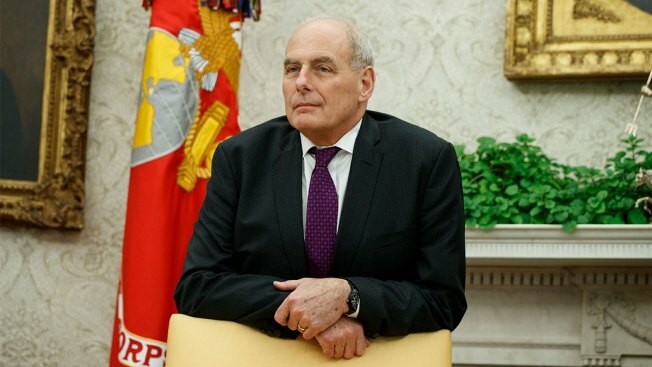 FILE - In this Nov. 16, 2018, file photo, White House Chief of Staff John Kelly watches as President Donald Trump speaks in the Oval Office of the White House in Washington. Former White House chief of staff John Kelly said he disagreed with some Trump administration policies — particularly on immigration — but dodged questions Wednesday about the president reportedly intervening to secure top-secret security clearances for his daughter Ivanka Trump and son–in–law, Jared Kushner. Kelly, in an appearance at Duke University, did not deny reports that President Donald Trump circumvented the usual process to grant the security clearances or that he later wrote a memo outlining his concerns about it, NBC News reported. He simply said he believes any such conversations with the president would be privileged and that he’s not at liberty to discuss security clearances.